Home oral hygiene can make a tremendous difference in your pet's comfort and health. Most of us lead busy lives. This often derails an oral health plan in our pets because like us, oral hygiene must be provided daily for the long term to gain any benefit. We want to to provide you with a variety of dental health care options to help you stay on track with your pet's oral health. We are happy to give you instructions in the use of any of our recommended oral health products. Like in humans, brushing is the single most effective way to maintain dental health. The mechanical action of the brush removes the sticky plaque and pet tooth pastes help to break down the components of plaque. 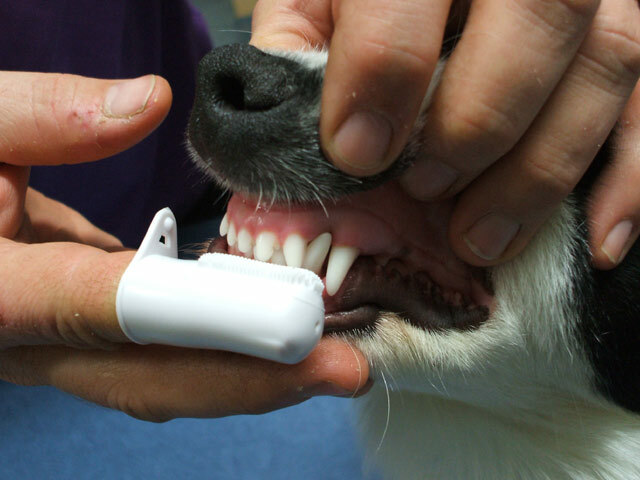 Most medium and large dogs tolerate a soft bristled, angled tooth brush designed for pets. Many small dogs and cats learn to tolerate a specific tooth brush that fits over the owner's finger tip. Oral rinses can be used in conjunction with daily brushing. One such rinse, chlorhexidine, has anti plaque and antiseptic properties. Another great product to consider is a veterinary dental diet. These diets have a unique kibble design that helps to scrub the plaque from the teeth and contains and anti-tartar additive that coats the teeth. Finally, some treats and chews can fight plaque and tartar build up. Visit our Information Page on how to brush you pets teeth.